I am participating in the “April Blogging From A to Z Challenge” for 2018. Except for Sundays, but starting with Sunday, April 1, I will be writing a post each day in April. Working through the alphabet, by the end of the challenge I will have posted 26 writings. Perhaps you might imagine or have even experienced this yourself. I am writing this post on Wednesday, April 4, 2018. Today would have been Joe’s 43rd birthday. The cloud of Grief I step in and out of is constantly changing color and texture and density. Even after almost seven years, I expect my most important Grief days to be held gently with care by all. Today is one of those days. It may sound strange to designate certain days as “important” when talking about Grief. But I didn’t designate them as such. Grief did. For Grief is a shapeshifter. It slowly burrowed a hole in my heart where it now lies quietly most times. Last night, on the eve of the most important Grief day a mother can experience, I thought I might spend the anniversary of Joe’s birth, quietly celebrating him. I thought that perhaps I might pull out all the photos. 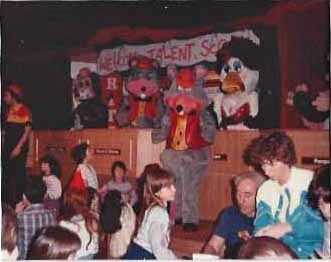 I pictured myself smiling at his birthday pics, especially the ones from “Chuck E. Cheese’s”. I would have to say that one had to have been his most favorite birthday party of all. Yes, I thought, that’s how I would spend the day. I had a fitful uneasy night, though, filled with disturbing dreams. I woke at around 3:00 a.m. My heart was racing. I felt strange. I came out to the living room and settled myself on the sofa. Eventually, I was able to fall back into a dreamless sleep. As I opened my eyes with the light of day, it took me a moment to gather my thoughts and bearings. My phone was beeping at me. A text message from my sister Marie. Still half asleep, my first thought was one of joy. 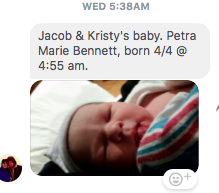 My sister was a grandmother for the first time! And then I saw the date. April 4. Grief smacked me in the face. It slithered out of its lair, wrapped its many tentacles tightly around my every part and squeezed the tears and sobs out of my being. Mixed blessing, a new birth on the day.